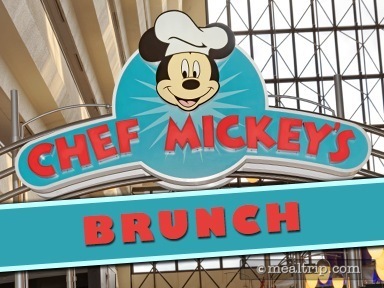 Rather than serving a full-on lunch, the Contemporary Resort’s “Chef Mickey’s” tags on a few hours to the breakfast period and turns out an American “brunch” period. The brunch is available daily until around 2:30pm. A few of the breakfast items are swapped out for a baked salmon, some barbecue pork ribs, peel and eat shrimp, and some dessert items from the bakery. Seasonal Frittatas, Sausages, Cheese Potato Casserole and some of the fresh fruit items remain from the breakfast menu. The Fav Five is still all there though... and that’s what guests go to Chef Mickey’s for! Mickey, Minnie, Pluto, Donald, and Goofy are all present and work the floor meeting guests and moving from table to table. The dining space itself is also quite unique. 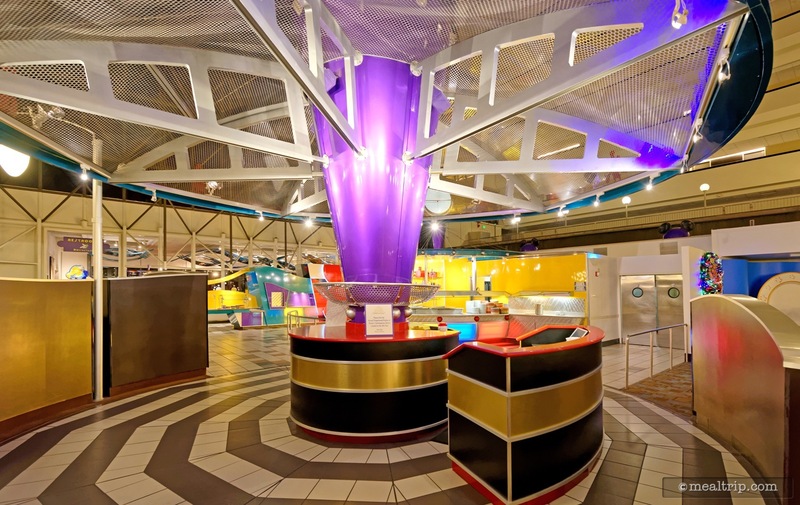 Two monorail tracks allow the futuristic monorails to pass right though the resort and are clearly visible from many of the tables at Chef Mickey’s, as is the legendary Mary Blair mural that defines the 4th floor as being the Grand Canyon Concourse.